The Chrysler Pacifica is one of the best minivans of the past and present, with plenty of room for passengers and cargo, useful features for family trips, and plenty of trim levels that can appeal to all budget options. If you need a family vehicle with plenty of room and useful features for entertaining and keeping track of the kids, the 2019 Pacifica can give you several reasons why you should buy it. Learn more about the 2019 Chrysler with our in-depth breakdown. The Pacifica Hybrid is the first-ever hybrid minivan. The regular Pacifica models already offer some of the best mileage numbers in the class, but the hybrid takes you a step beyond. While the Pacifica gets a combined 22 mpg, the Pacifica Hybrid can give you 32 mpg. On top of that, the Pacifica Hybrid is a plug-in model that lets you charge the battery from a home outlet and drive up to 33 miles on nothing but battery power. The hybrid engine also offers a secondary bonus: The instant torque of electric motors lets you quickly accelerate. The Stow ‘n Go seats are exclusive to Chrysler Group minivans. They let you quickly and easily stow the second- and third-row seats in compartments built into the floor, giving you a flat loading surface in just a few moments instead of having to put cargo on tilted seat backs or wrestle a seat bench out of the minivan’s back. In addition, when the seats aren’t stored, you can still use the compartments to hold other things. This makes them very handy when you take the family on a road trip. Every 2019 Pacifica comes with a long list of standard safety features, but you can get even more, depending on which trim level you choose. One of these features is the Full-Speed Forward Collision Warning with Active Braking, which checks the road ahead for obstacles and can start braking for you if it senses a possible collision. Some Pacifica models can even park themselves, thanks to Parallel and Perpendicular Parking Assist, and you can see where you’re going, thanks to the top-down Surround View Camera. Your backseat passengers will discover time flying by when you get a model with the available Uconnect Theater. With this feature on board, the back rows get twin 10-inch touch-screen displays built into the front seats, a Blu-Ray player, and two HDMI inputs that can interface with gaming systems. You can also connect certain wireless devices and stream video to the displays. The Uconnect Theater also has its own set of interactive car games that can keep kids engaged. There are plenty more reasons where these came from, such as the available Harman Kardon sound system, the tri-pane panoramic sunroof, and the stylish S Appearance Package. 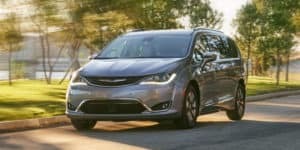 With so much to offer, it’s no surprise that the 2019 Chrysler Pacifica is one of the best minivans you can buy. Take one out for a test drive today and see why for yourself.